There are some music artists who simply play music. And though they are passionate about their art, their music does not resonate with their listening audience the way other music does. Then, there are music artists who pour their heart and soul into their compositions and performances. As they play their music, they transform into a virtual conduit which allows their music to flow through them. They become a great painter like Michelangelo or Rembrandt. The world is their proverbial canvas, their instrument is their paintbrush, and their music becomes the broad-brush strokes that fill the canvas with magnificent colors of melodious tones. The result is a masterpiece that tells an amazing story that speaks to the heart and soul of the listener. Such is the case with the awe-inspiring music of virtuoso Jennifer Thomas. 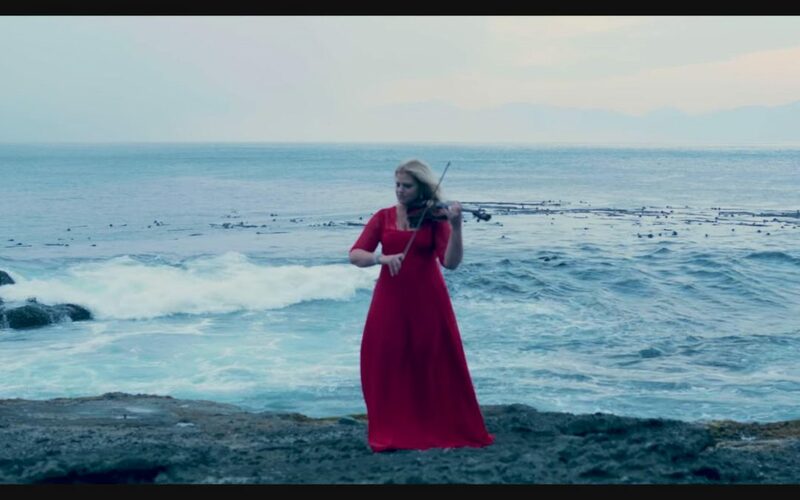 On 27 February 2018, Jennifer released a video of her original composition “The Tempest” from her album Key of Sea – 10 Year Special Edition. Not only did she compose the masterpiece, but she is also responsible for the orchestration, and performs the magnificent piece on both piano and violin. Credit for the breathtaking scenery in the video is owed to the masterful skills of her husband Will Thomas. The video was edited with unused drone footage from Jennifer’s music video shoots. Throughout the video, the music combined with the beautiful scenery help to paint the picture of what is about to happen. 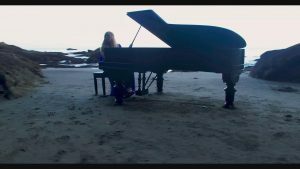 First, there is a sense of calmness as we see Jennifer wearing a blue dress, playing a piano on the beach with the gentle ocean breeze blowing behind her. At that moment in time, the world seems to be at peace. 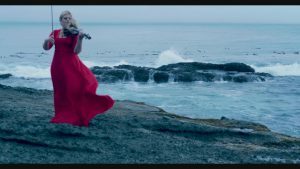 Then we see her donned in an elegant red dress with violin in hand, standing on a cliff with the winds blowing and the increased force of the ocean waves crashing against the rocks directly below her. As the tempo of the music picks up and we see the billows of the waves begin to roll, it is apparent that the tempest is beginning to rage, and a storm is imminent. And then, almost as quickly as the storm began, we see the calm blue ocean. The wind and the waves have subsided. And as Jennifer plays the final note on her violin, we see her standing on the cliff, looking out into the ocean, with an expression of a sigh of relief that the tempest is no longer raging, for the storm has passed over. Peace and serenity reign again.